It is not an easy to task to visualize an organizational structure of any company or institution. Sometimes organisational structure could enclose more than thousand persons which work in different departments. Any types of organizational structure can be presented in the form of an organizational chart which creation is supported by ConceptDraw. There are many methods of structuring an organization, determining how it might operate. Often the organizational structure adapts to the production process depending on the type of production and kind of production. The choice of the method depends on the business objectives, dealing with the fact that in the future it will affect organizational action in many ways. First, the structure provides the foundation for standard working operations. Second, it defines the group of people making key decisions in the company, and the extent to which their point of view affects the activities of the organization. The most often-observed organizational structure is bureaucratic. This structure is the most standardized with its characteristic features like strictly defined roles and responsibilities and hierarchical structure. Such structure is common among large corporations and enterprises. Bureaucratic companies have well-developed levels of management starting with the top echelons of power ending with the heads of departments, which complicates immediate decision implementations due to the necessity of its adoption at many levels. To facilitate the workers’ understanding of their responsibilities, and for a clear understanding how to action in all occurring situations, org charts are being created for every department. As the authority of such organizations is at the top, the information is distributed from the top to the bottom of the hierarchical tree. This is the bureaucratic structure main advantage for top managers, since the strategic decision-making process is quite fast. The disadvantage of this system is its inflexibility due to the rigidity of its policies, therefore, making significant changes and innovations almost impossible. Also, these corporations can discourage creativity which makes it difficult for a company to fit if the marketplace conditions change. Another way to organize a company is to group people by their functions. Functional organization structure divides company onto departments basing on functional areas such as human resources, production or marketing. Organizational chart is a type of diagram which presents a corporate structure as a tree, where the root is the head of a company, for example the President. 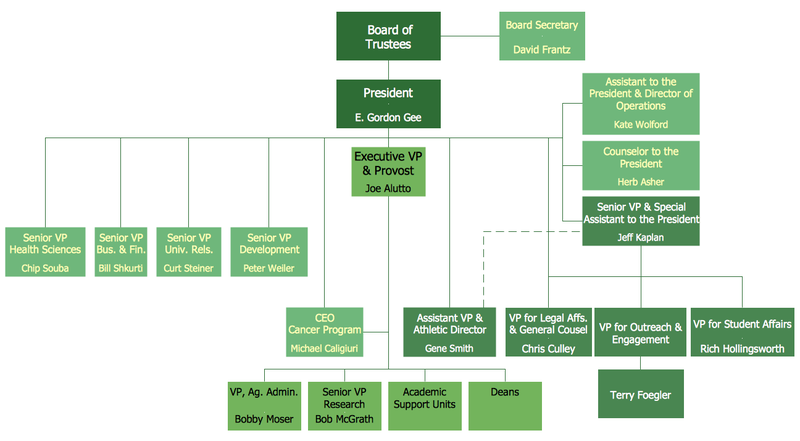 The first level of branches in this tree is a heads of different departments which submit directly to the President. In such way you can add all workers to the diagram to completely depict the organizational structure of the company. Moreover, using ConceptDraw you can create the corporate structure diagram from ready “smart” shapes with gradient color to get the clear picture of the hierarchy levels in the company organizational structure. ConceptDraw has a set of sample organizational charts. Organizational structure is a method of representing relationships within an organization, a structure of the interrelated groups of an organization. In most cases Organization structure is depicted in a special form Organizational Structure Chart or Org Chart. Organizational structure diagram is designed to represent the current structure of an organization, or show communication and coordination flows. It's recommended to draw an organizational structure diagram to display your vision of your organization. CSOdessa team is happy to provide a cost effective Organizational structure chart software for company of any size. Automate Organizational structure chart creation. Import data from particularly any source. Company Organizational structure chart with detailed staff information. Specialized Organizational structure chart creation tools. 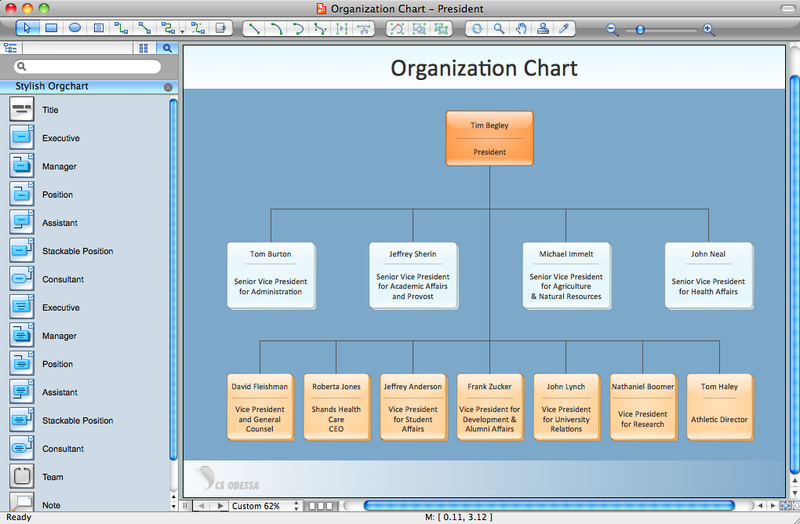 Single and multi-page Organizational structure chart with hyperlinks. Possibility to publish the Organizational structure chart and corporate contact information on the Web, intranet. Only ConceptDraw Organizational structure chart software gives you all these benefits at such a reasonable price! This type of organizational structure diagram is designed according to functional areas. This type is best to be used for creating some specific, uniform products. The common drawback that can be found in such a kind of organizational structure is difficult communication. You can easily see this if you draw communication flows on the organizational structure diagram. This type of organizational structure chart is grouped to reflect workflows in your organization. They can be divided by product lines, regions, etc. This organizational structure is very flexible and efficient but there are also some shortcomings. 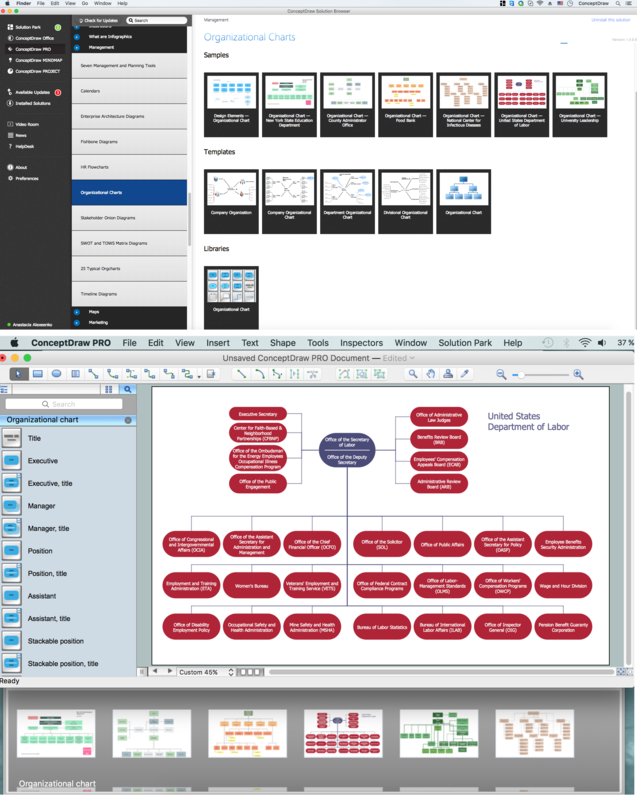 If you have any questions on how to use ConceptDraw for organizational structure diagramming, please email us.